One of the more prolific budget tablet makers is Coby, and they’ve just released a whole slew of new Android 4.0 tablets in various sizes, ranging in price from $109 to $289. All seven Coby Kyros tablets are available for order at Amazon, with an expected release date two weeks from now on April 23rd. One of the tablets is already shipping, the 9.7″ model. The tablets have different screen sizes and some come with options for a camera and mini-HDMI port, but they all basically have the same specs. None come with the Google Play store on-board—they have GetJar instead, and of course other appstores will work as well. There will most likely be a hack to add Google apps too, so that will probably be an option down the road. Each Coby Kyros tablet comes with either 4GB or 8GB of memory, a microSD card slot for memory expansion, a 1GHz Allwinner Cortex A8 processor, 1GB of RAM (the cheaper two have 512MB), WiFi, a microphone, headphone jack, and built in speaker. $109 Coby Kyros 7-Inch MID7033 – With an 800 x 480 resolution screen, the cheapest of the bunch is the only one to have a resistive touchscreen. Resistive screens are notorious for being unresponsive and somewhat difficult to use at times; they tend to work much better with a stylus. So unless you are feeling really cheap, the next model up is going to be a better option. $149 Coby Kyros 7-Inch MID7035 – This model appears to be exactly the same as the one above with the exception that it has a capacitive touchscreen instead of resistive. From my past experiences with resistive screens, $40 is worth the upgrade. $179 Coby Kyros 7-Inch MID7042 – This model also has a 7″ 800 x 480 capacitive screen, but is comes with a couple of upgrades over the MID7035 with double the RAM and a built-in front VGA 0.3MP camera. It also has a mini-HDMI port according to Coby’s website. Not sure if the cheaper ones have that or not because they aren’t listed on Coby’s website yet. $229 Coby Kyros 8-Inch MID8042 – This tablet has an 8″ 800 x 600 display. Otherwise it appears to be the same as the MID7042 listed above, with 1GB of RAM and a built-in camera. 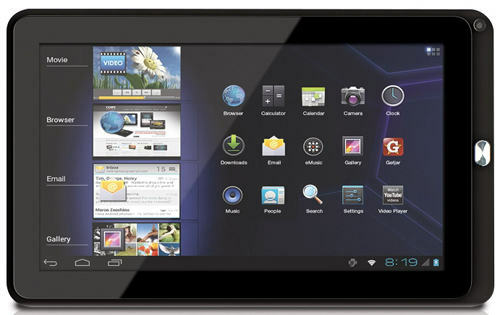 $259 Coby Kyros 9-Inch MID9042 – This tablet has a 9″ screen with a resolution of 1280 x 800. It has a camera, 8GB of memory, and the same features as the equivalent 7 and 8-inch models. But this model isn’t expected to ship for 1-4 months, according to the listing at Amazon. $279 Coby Kyros 9.7-Inch MID9742 – This is the only model currently shipping. The MSRP is $279 but it is currently selling for $245. It has a 1024 x 768 resolution screen, 8GB of memory, a VGA 0.3MP front camera, a rear 2.0MP camera, and mini-HDMI port. $289 Coby Kyros 10.1-Inch MID1042 – This model has a 10″ 1024 x 600 resolution screen. It has 8GB of memory and camera. There’s no specific details on this model yet, but it’s probably got the same feature-set as the 9.7″ version above. I decided to order one of these Coby Kyros ICS tablets myself to review, but I didn’t want to spend a lot so I picked the 7″ $149 model. I’ll have the review posted at the end of the month. Check back again or subscribe to keep updated. Why buy an android tablet with an 800×480 screen? My two-year-old cell phone (an HTC Incredible) has an 800×480 screen…and of course it runs the Google Play store, and has a capacitive screen. And this is technology that is two years old! It a tablet is bigger than a cell phone, it darned well better offer a much higher resolution display! Otherwise you can get the same thing, in a smaller package, at a lower price, by buying a smartphone. Coby’s wide array of models with only small differences makes for a confusing experience on their website. They don’t offer an easy way to compare them. Price-wise, given that they’re a budget tablet maker, they don’t seem to offer as good a value as the Kindle Fire or Nook Color/Tablet. You should also mention the quality of Coby products. I had one that the battery completely died on straight out of the box! If Coby can come out with these makes you wonder what Amazon has got cooking?? The official Android market for apps is now called the Google Play Store, right? Yep. They’ve stuck everything into the Google Play store and ditched the old names everyone is familiar with to make it nice and confusing and awkward.